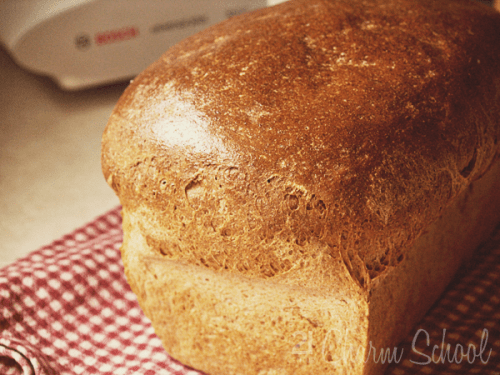 Sometimes I just need some good old homemade whole wheat bread. It soothes a myriad of ailments, and makes my house smell good to boot. I’ve been working on perfecting mine, as I’ve never been especially good at yeast baking. I think I may have finally gotten to where it at least rises every time. For a while there, I had these solid little lumps of doughy whole wheat. Kind of like a brick. One of those hasn’t shown up in my kitchen for a while now, though, so I think I may be out of the woods on that particular phase. The next phase of my breadmaking career was the part where I kept making loaves that were too dry. They tasted great, and held together just swimmingly right out of the oven. Then, a few hours later, they were a crumbly mess. Too much flour, I was told. Then, about a month ago, a lovely woman taught a class at a church activity about bread making. I had the same wheat grinder as her, and the same mixer, so I figured I couldn’t blame the bread problems on my equipment, at least. So I went. She gave me the perfect recipe, and I haven’t had a bread problem since. So, my lovelies, if you’re a little less than savvy in the bread making department, maybe you should give this little beauty a try. It makes your house small absolutely amazing, and it tastes great too. Homemade whole wheat bread. Yum. I haven’t made bread in a long time. I should start again soon. Maybe next week…or next month. We will have to see. It would be soooo good for you…and baby noodle too.